The Multi-Link Polnet ACP-500 installs on an analog phone line and answers inbound calls at the first sign of ring voltage. After the ACP-500 goes off‐hook, it immediately screens for fax and security access codes (SAC). During this processing period, a Bell spec “ring‐back” tone is issued to the calling party. The Multi-Link Polnet ACP-500 is five port data polling call processor that eliminate up to four phone lines by auto-routing modems you connect to over a single business line. The PolNet ACP-500 Voice/Data Processors alleviate network dependency on dedicated lines by expanding any existing voice line to accommodate up to 4 extra devices. That's a total of five communications devices sharing one phone line - efficiently and effectively. We guarantee the ACP-500 will process calls to any type of data equipment that requires a phone line to function: any type of modem - regardless of speed, throughput or standard, and type of data terminal - credit card authorization machines, money order terminals, Underground Storage Tank monitoring systems, alarm/energy control systems and more. Stop wasting money. Incorporating PolNet ACP-500 into your information network can have a dramatic positive impact on your budget! 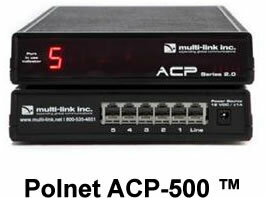 Use the Polnet ACP-500 and save the expense of 4 phones lines. The Polnet® ACP-500 is made in the USA. Interested in purchasing the Polnet 2,0? Questions about the Polnet 2.0 ACP series?